The function of a steering damper is to dampen or control the side-to-side sweep motion of the handle bars. Tank-Slappers, high speed wobbles, and hitting any road debris should be absorbed and controlled by the steering damper. As well as reducing fatigue and arm-pump. Unfortunately stock steering dampers are usually of the linear type, not adjustable and fall way short of doing what a proper steering damper should do. We firmly believe it’s better to control a rotary motion with a rotary damper, not a linear damper. Our patented rotary design and fluid control is implemented into 3 designs that were created for the best fit and function for dirt bikes, sport bikes, ATVs and Harley Davidsons. Check our products below or hit our Kit Finder for a specific application. The GPR v4D is the fourth generation steering damper designed for dirt bikes and adventure bikes, but is also used on a couple of hybrid applications. Its compact and slim design allows for the damper to be mounted below the handlebars, out of harm’s way, without raising the bars more than an inch. Frame mounts are machined steel with stainless steel pin, and billet aluminum machined bar-mounts. Choose the GPR Pro Kit option and you’ll get a black anodized machined top-clamp. This is GPR’s first generation design of a rotary steering damper, well close to it at least. It still retains the original footprint but internal valving and fluid controls have evolved over the years. One center dial, adjustable as you ride and completely rebuildable. Take the V1 damper and mount it under the bars for the V2 version. Mounting the damper under the bars give the taller riders the bar height they are looking for and keeps the shorter post mount flex to a minimum. Stripped out bar-mount threads? Broken or bent frame mount? Lost that dust cover or wanting to put that older damper on your new bike? Fit Kits are combined with the necessary parts and hardware to update you application. 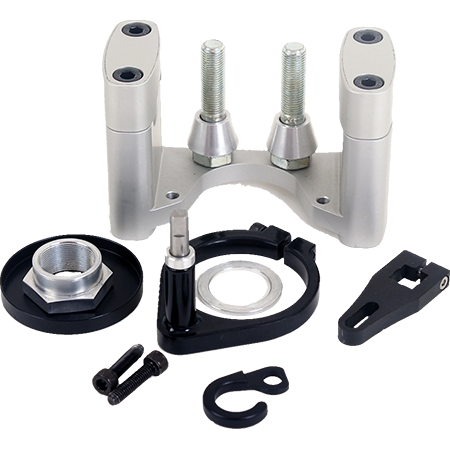 The best way to get the correct parts to mount your steering damper properly is to call us at 619-661-0101 or email us and one of our technicians will contact you with the best solution.